Google has enhanced its Google Suggest feature for mobile phones in the US, meaning that a query will bring up the answer as you type it in. The feature – enabled on Android-powered devices, iPhones/iPods and Palm WebOS devices – is currently only confirmed for the US, but is likely to appear globally. "Today, we are bringing [enhanced Suggest] functionality to mobile phones so that getting answers while on the go is even faster and easier," said Google on its mobile blog. "For example, let's say you're flying to London and want to know: Is my flight on time? Or what is the exchange rate of the pound?" the post adds. 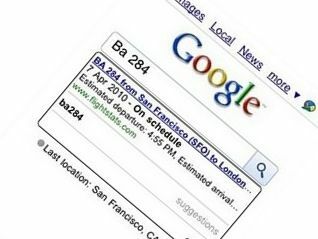 "As you type the flight "Ba 284" or "Usd in pounds", the answers are provided right below the search box, without having to wait for the results page. "Other searches that show answers include weather (e.g., "weather london"), stock quotes (e.g., "intc"), current time (e.g., "time london"), calculator (e.g. "29*37") and unit conversion (e.g., "220 miles in km")." When available you can test the feature by pointing your phone's browser towards the Google search engine. And if you are short of something to do you can start trying to find the always funny Google Suggest suggestions that pop up for some queries.